When you think about socks, you usually don’t think about them lasting forever. After all, they’re socks, right? They’re supposed to fall apart in less than a year. Well, I’d like to shatter that misconception with one word: Bridgedale. These are the kind of socks that will last you for years and years and years of heavy use. Think I’m kidding here? I’m not. Bridgedale socks are amazing. 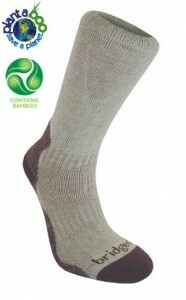 And, they’ve come out with an eco-friendly line of bamboo socks that I’m completely in love with. 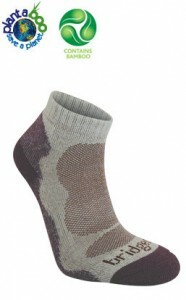 I first came across Bridgesdale socks when I was in college, working at an outdoor retailer. The company had sent a rep out to the store to teach all the sales staff about how fantastic these socks were. Well, this wasn’t just a spiel. I left that training class thoroughly impressed, and ended up ordering five pairs of low-cut Bridgedale socks for myself. I’ve now had these socks for over 7 years. And I’m being completely honest when I tell you that these 5 pair of Bridgedale socks are heavily worn by me, still. I mean, they’re my primary socks. If I have shoes on, then 90% of the time I’m wearing a pair of these Bridgedales. As you can see, they’re only just now starting to break down in the heel area. And, I haven’t been kind to these socks. They’ve been all over the country, on all sorts of adventures, and I’ve never “air dried” them like you’re supposed to with super-nice socks. They’ve gone into the dryer with all my other clothes. And they’ve still held up. I’ll be the first to admit that Bridgedale’s are a bit pricy. After all, one pair of the Bridgedale Bamboo Low socks I’m about to tell you about sell for $14 at REI. The higher Trekker socks (which I also have a pair of) sell for $19. But, look at what you’re getting! I mean, my Bridgedale’s were an investment. But heck, they’ve lasted 7 years so far. They’re incredibly comfortable, they keep my feet dry, and of course, they last. You can bet I’ll keep wearing them until the bottoms fall of. This kind of quality makes these socks worth every penny. Sure, you could go out and buy $5 socks and replace them every 6-12 months. Or, you could invest in some of these and keep them for years. Me? Well, I’m never going back to another sock, I can tell you that. It’s just not worth it. This company has won my heart simply by making a great product that I can count on. 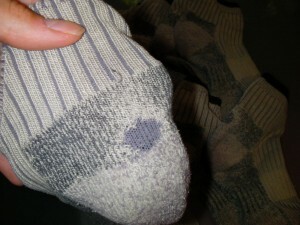 And if you’re wondering how Bridgedales compare to Smartwool socks, don’t bother. I bought Smartwools that same year (another rep came to the store to train us, and they offered a deep discount). My Smartwools have long since broken down. There’s just no comparison. The new Bridgedale bamboo line is really nice. These are the first bamboo socks I’ve ever worn (since, thanks to my old-school Bridgedales, I rarely buy socks) and let me tell you: they feel like sliding silky loveliness over your feet. 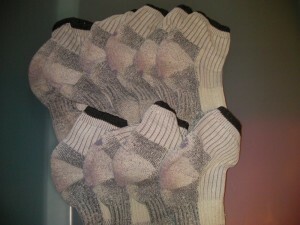 They’re incredibly soft, and work just as well as regular Bridgedale socks for wicking away moisture. I’ve been wearing them for almost two months now (running, hiking, hot summer walks) and I’m very happy with how dry my feet have stayed. Will The Bamboo Socks Last As Long? This is a good question, and I really don’t know. I spoke with a rep from Bridgedale a few months ago, and he wasn’t sure if the bamboo line would last as long as the regular merino wool/polyester blends, simply because bamboo yarn isn’t quite as durable. But, again, he wasn’t sure. Whether or not they’ll last 7+ years like my old ones, they’re still an incredibly high-quality sock. I’d be willing to bank on them lasting at least a few years of hard use. Especially if you air dry them. I guess all you can do is just test them out yourself to see. And for me? Well, I’m in love with the two pair of bamboo Bridgedales I got. And when my 5 trusty stand-bys finally wear out, I’ll give them an honorable burial for all their years of service and promptly go out and buy 5 more pairs. I too thought bamboo meant green and good.. now I think twice. Big companies can ruin everything. Chandra, Thanks so much for sending that link! I’ll definitely go check it out.